Many people toss their plastic bottle or cardboard box in the recycling bin without considering what will happen to the items afterwards. At Maren Engineering, that bottle and cardboard is at the heart of what drives their business. Maren Engineering manufactures balers for recycled products all along the spectrum from foam and cardboard to metal scrap and wires. For over 50 years Maren Engineering has been leading the way with high-quality, efficient world renown balers and shredders that companies can rely on. There are many ways to help websites increase their customer growth. Our team worked with Maren to increase their search engine optimization (SEO) which will in time help garner more traffic to the website. Our team also updated the website’s menu bar and copy throughout the site for an easier navigation. 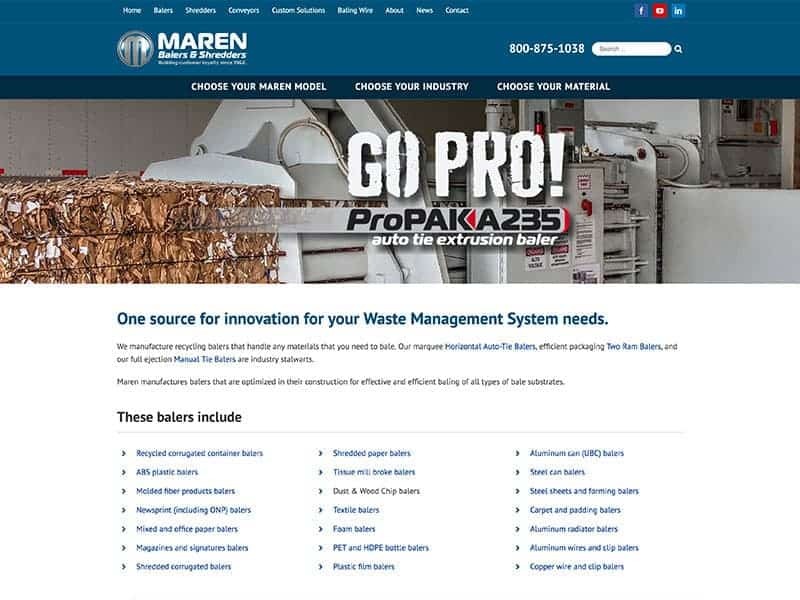 Updating the website means Maren Engineering can make edits to their website with ease. The new website includes strong calls to action and encourages uses updated forms that are simple for visitors to use. The updated website looks stunning and highlights Maren Engineering’s products. SEO is a great way to increase traffic to your website. Contact our team to learn more today!